A 'new normal' for bricks, bars and shares...? SO the U.K. failed on Friday to exit the European Union as promised if not planned, with Parliament fighting instead like cats in a sack, writes Adrian Ash at BullionVault. This March also marked 10 years since the UK's central bank slashed interest rates to a record low of just 0.5% and joined the fun of quantitative easing to start printing money – or at least, its digital equivalent – in the hope of fighting off the global financial crisis. Brexit and QE are, we guess, not unrelated. Fleet Street and Westminster hacks alike claim that frustration and resentment of everyone except, umm, themselves fueled the 51.9% of the electorate voting to quit the EU. So if Brexit truly is revenge on the capital's "elite", then good news for the downtrodden, says one clickbait report. Because London property prices are now falling at their fastest pace since the financial crisis, albeit a measly 3.3% annualized drop so far. Half of all babies born in the UK are meantime starting life in private rented accommodation reckons another click-bait rage-stoker. Up from "only about a third of children" on the eve of the financial crisis, that is a necessary corollary of the unmentioned surge in private landlords, able to use their existing (and QE-fueled) wealth to raise a mortgage or pay cash to build their own little property empire. Let's put the politics of both Brexit and QE aside for a second however. Because if you're looking to protect yourself (or profit) from the former, you might struggle to find much value thanks to the latter. See, everyone needs a home to keep warm and dry. They also need a way to grow their savings. Gold on the other hand does nothing. It doesn't even rust. 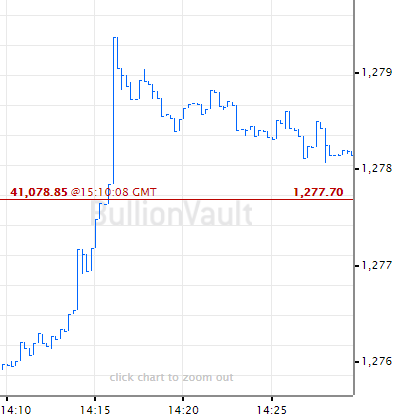 Yet while UK house prices, like the stock market, today sit near all-time record highs, gold might also look dear to UK savers and investors, trading just shy of a £1,000 handle as Brexit drags on...and on. But because chemical element No.79 never changes physically, its use to humanity hasn't changed much either across the centuries. Yes, it was money for long stretches once or twice in history. 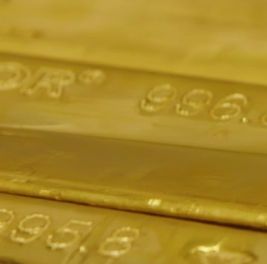 But that use came about thanks to gold's existing and now subsequent use of simply storing value. And unlike the currencies we typically use to value house prices or shares today, gold offers a yardstick no-one can inflate or destroy. This means that measuring the price of bricks or equities in terms of gold can help cut through the noise of markets up, markets down. Where the lines rise, gold lost value against real estate or equity. When the lines fell, the unchanging metal was worth more in terms of bricks or stocks. 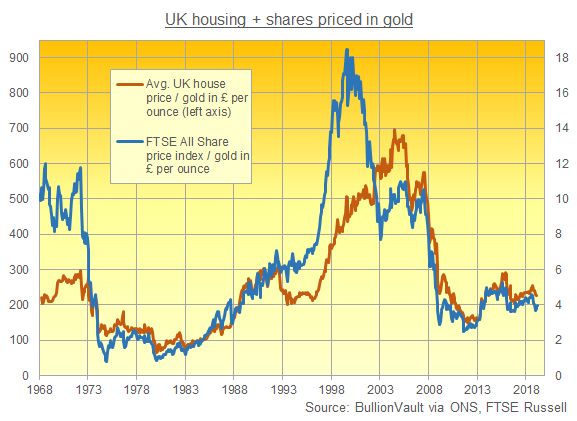 And as you can see, the manias and panics in UK housing versus shares have differed in size and peak when priced in ounces of gold. But the underlying trends in bricks or stocks have pretty much tracked each other across the last half-century. Rising in the late 1960s, both the FTSE and the average UK house price slumped when inflation jumped in the early 1970s, before rallying across the '80s, surging in the '90s, and then whipping violently so far since the Millennium. From there, bricks and stocks have moved ever more closely together over the last 15 years. 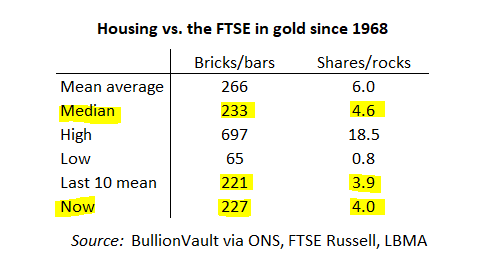 The co-movement since 2004 has in fact outshone the 15 years starting 1980, when the peak in world gold prices saw UK houses finally bottom in terms of the metal, and the FTSE/gold index came within just 2 grams of its 1974 crash low. The mean average you know and meet every day. It adds together all the data (here being the value for every month in our 51-year series) and divides by the count. But on the full 5-decade timescale, the median may prove more useful. Because it shows you the mid-point...that place from where the price of houses or the stock market in terms of gold spent half the time higher, and half lower. 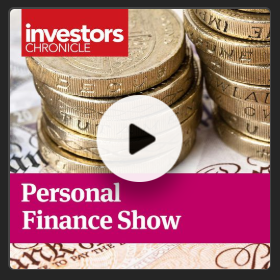 Right now – with Brexit delayed if not frustrated forever – UK house prices and the stock market are pretty much bang around average on both their long-term median and the last 10 years' mean. If you're looking for value, history has little to say. 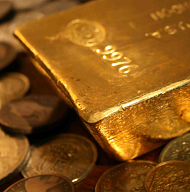 Gold prices could go either way from here in terms of bricks or stocks. But if you're trying to pick between houses or shares, they look increasingly joined at the hip, at least when viewed from here in the vault and priced in silent, unyielding gold.